This book is intended to serve as a bridge, linking the philosophies and practices of homeopathy and taoism. It is hoped that something of the magic of homeopathy may be glimpsed through the perspective of taoism, whilst the ancient wisdom and wit of the taoist sage may, in the guise of a homeopath, find a new audience. It is also my intention that something of the essence of homeopathy might be conveyed through these pages in a way that non-homeopaths will grasp, perhaps more readily than homeopaths themselves. On the surface, homeopathy may seem like a quaint and somewhat antiquated system of medicine. Further investigation, however, soon reveals a vast ocean of widsom that offers up healing possibilities bordering on the miraculous, together with an underlying philosophy that has the potential to permeate and inform, if not transform, one's entire life. Here are a few questions to all homeopaths: What happens when you get stuck? What do you do when, brilliant results one minute, yield nothing the next? Or how about the u-tum patient who, for no good reason, stops getting better, despite the careful and painstaking choice of your selected remedies? What about the obvious, missed? All can add up to panic and a feeling of being a big, bad homeopath. So what to do? Well, we talk and we read in order to understand and move the health of our patients and ourselves along, in the hope the light bulb in our head will ping into action. While you're waiting, though, you might try looking at The Tao of Homeopathy, by Ian Watson. In his introduction, Watson writes, 'I have come to feel homeopathy and Taoism are saying much the same thing . . .and it strikes me as a potent message for these troubled times. Stay open. Trust life. Attune to nature's cycles and seasons.' Those last few sentences contain the essence of the book, whose intention is to present Tao principles and homeopathy as similars. It's a book to thumb through and think about; to meditate on, if you like. It offers some valuable insight into the art of trust and encourages stillness; indeed each page is a little universe of contemplation. The simple format and clean design allows the eye space to rest upon any of the 86 texts, with subjects ranging from interconnectedness to emptiness, doing nothing to doing too much. Homeopaths read a great deal of literature; there is always something to search through, whether news of provings, technique, methods or something else; mostly exciting, sometimes tosh but nonetheless, capable of ns.co.uk sending the head spinning. We are by nature, searchers, and several years in, (or sooner if we're wise), we realise that most of the work to be done is centted on the self. This is where this book can be of value, don't go looking for cures for that pesky eczema case hete, you won't find them, but you may find another way of looking, in order to find. Take this excerpt from the chapter called 'Prevention' for instance, 'Many people are grateful that the homeopath took away something that was troubling them. Few will ever know that what was prevented from arising in the first place was the greater part of her work.' There it is; this is our aim in thirty-five words. There are gems like this scattered throughout; it's a kind of one-size-fits-all book presented as a guide to 'being'. However, therein lies the big question; are you ready to 'be'? Phrases influenced by centuries of wonderful Taoism are all well and good, but do Watson's words stand up to scrutiny? Well, yes and no, but it is the bold and puzzling statements in much of the book that I wrestled with. For instance, he writes, 'Yin and Yang, Sol and Luna, Heaven and Earth. The counterpart of homeopathy is allopathy.' How so? Yin and Yang are two halves of a whole; isn't allopathic treatment and its ineffectiveness something we (and our patients) struggle with daily? Don't we try to undo the damage cause by allopathic medicine and sometimes despair at it? Allopathy is not the exact counterpart, as in equivalent, of homeopathy. In his introduction Watson states that possibly non-homeopaths will realise something of the essence of homeopathy after reading this book. I do hope so. Having said that, it would be helpful if they don't see us as the pure beings Watson describes, who come across like some sort of (all female) spectres, floating here and there, casually dropping eternal knowledge like handkerchiefs for our earth-bound patients to pick up. So just who is this book for? Anyone and everyone is the answer. It's a book to return to, to find answers in, and to gaze upon Rana Chalabi's beautiful artwork. This is a series of aphorisms which are beautifully crafted and a pleasure to read. They inspire the reader in the way that poetry can stir the imagination. this book reminds you of what you always knew, it is a book full of universal truths and the wisÂ­dom of the Tao which fits so well with the principles of homeopathy. 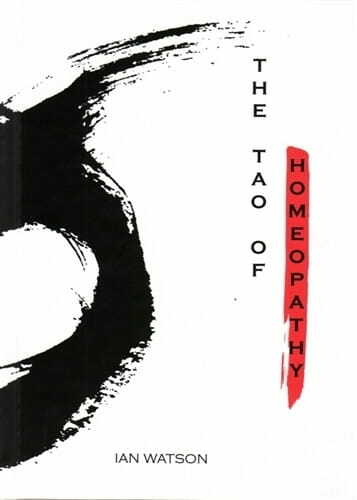 Ian Watson describes his book as 'a bridge, linking the philosophies and practices of homeopathy and Taoism'. This is not a book about how to prescribe; it is about healing. It offers readers a space in which to reflect on their practice, while offering a wealth of considerations which we would do well to heed. In the section entitled 'The Healing Process', Ian Watson writes that 'the wise homeopath remains mindful that many tnmgs may encourage a return to health, and does not imagine her own contribuÂ­tion to be more or less important than anything else.' If this course is followed, then the homeopath can be reassured that she has done her best, and 'She attributes no blame when her treatment fails. Nor does she claim the credit when a cure results. In this way she keeps her centre through good times and bad' ('OutÂ­comes'). calm and enhance the text. The book is a pleasure to handle and a delight to the eye. Each section is illustrated with calligÂ­raphy deriving from Arabic script, the meanings of which - explained at the end of the book - add a new dimension to the text. In the section called 'Doing Nothing', we are reminded that 'When she rests in the place of non-action, everything gets done without any effort.' This seems like a recipe for a stress-free life, and could as easily adplyto getting the ironing done as working in a busy homeopathic practice.